Dany Laj is jealous of all the attention that the Pope has been getting lately. Along with his crack team The Looks, he has decided to don the robes, get back into his Popemobile, and head out for his third Eastern Canada tour in six months. 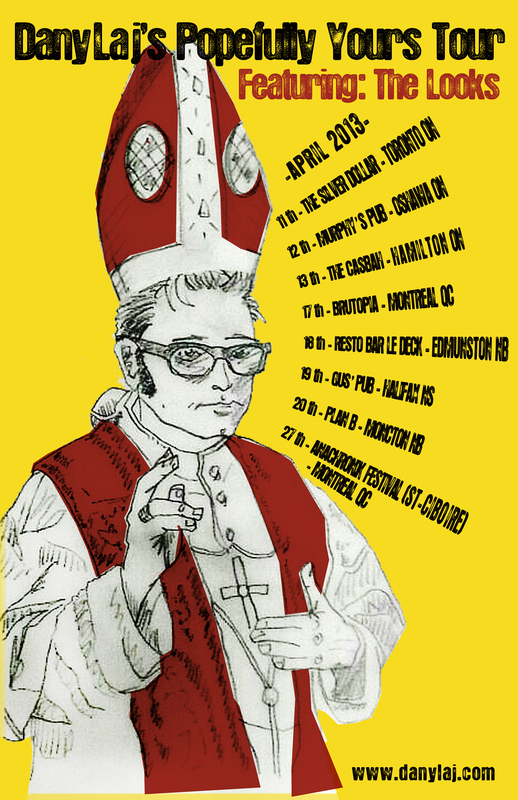 The People’s Pope will give rock & roll sermons on humility and compassion to his adoring masses along the road to the east coast. Originally hailing from Kirkland Lake, a mining town in Northern Ontario, the Pope Dany was duly elected by a conclave of rock ‘n roll cardinals and hockey bishops. Come on out, participate in this musical communion and imbibe the holy spirits with he who is Popefully Yours, Dany Laj. “I’m on a mission to liberate every collapsed Catholic on my path. I want to let them know that’s there’s an alternate option: a People’s Pope. I’m here, I have arrived. Pleased to meet you,” says Laj. Joining the People’s Pope on this tour will be The Looks, consisting of Arch-Bishop Lewis Handford and Mother Jeanette Dowling. In support of the “Telepathic Voices EP” Brought to you by Boppa Do Down Records. So, folks, this month will mark 17 years of me playing music. 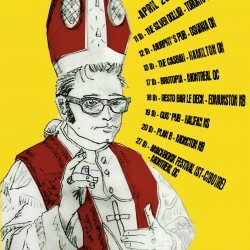 I had my first experience playing guitar in a punk band called Swank in March of 1996 at the Polish Hall in Kirkland Lake ON, and through all these years I have never stopped being active. Things have changed drastically in the music business since then – the digital age has hit us in full effect; people have come and gone. I’ve played in many bands since then; I’ve traveled and still travel everywhere around this country. I still, after all these years, haven’t really figured anything out – to this day I book most of my shows on the phone, and make my own posters, contracts and contacts the old fashioned way. I put out records, go out to shows, build new friendships, and fight for what’s right. I am able to do these things thanks to people like you who are reading my blog. So to all my present and past band members, the people who come out to my shows, pay the cover, buy my merch or buy me a drink or two, the bands,songwriters and dj’s I have shared a bill with, the bars,venues,festivals and promoters who have believed in me: thank you so much!! 17 more years to go! In other news, we have a new double A side split 7″ coming out in June. 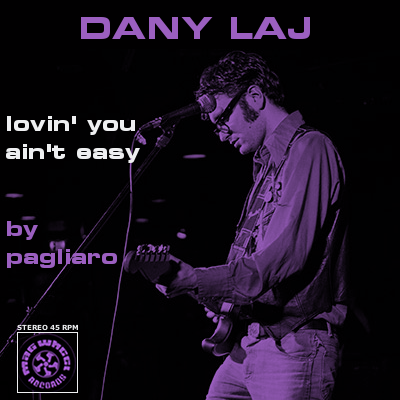 The 45 will feature our cover of Quebec’s first true rocktar, Michel Pagliaro’s “Lovin You Ain’t Easy”. The cover (above) was laid out by Jeanette Dowling and the cover photo was taken by Jack Martin (www.sevres-babylone.com). The other side will feature Pittsburgh’s garage pop sensation, Meeting of Important People (http://www.meetingofimportantpeople.com), covering a song from 60’s pop band Every Mother’s Son. This 7″ will be brought to you by Mag Wheel Records (http://www.magwheel.com). Check out the great reviews for our “Telepathic Voices” EP from Sweden and The UK. Please be sure to buy our music at our bandcamp site (http://danylaj.bandcamp.com/album/telepathic-voices), both of our ep’s are available there digitally. On another note, we do have a whole record in the can, we’re just shopping around for a proper release. A new video is in the works for the song “What’s Wrong With You” on our last ep, Telepathic Voices. Check the shows section for our upcoming shows – we’ll be back in the east coast and southern Ontario in April, with a fresh new batch of merch for you. See ya there.